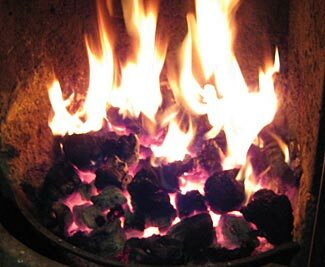 We love coal fires and their distinctive appearance and smell. The fact they are also a very efficient and low cost way of heating is a further reason to consider coal as a fuel source. If the concept of coal as a fuel source appeals, you need to shift from the theory to the practicalities of what it will cost to buy the coal, how you will store it, and other related issues and considerations. Our earlier article, ‘Coal – A Prepper’s Friend of Foe‘ looked at the overall issues to do with coal, this article looks at some further specific things to consider when evaluating coal. Clearly the closer you are to a coal mine, the lower your cost of coal will be, although another factor will be the ease of shipping coal to your location. Here’s a somewhat dated but still accurate map showing the spread of coal fields across the country, and here’s a link to the latest US Energy Information Annual Report on coal which has details of mines and their production levels and much more. If you are wanting to buy significant amounts of coal, then you could consider buying full rail wagon or truck loads. A full truck load is about 24 tons. But if you are wanting more moderate amounts (especially to start with when you might be experimenting with different sizes and grades of coal to see what works best with your setup), you should find the closest possible coal merchant. If you can’t find any nearby coal merchants, you could contact the closest coal mines and ask them for referrals. Of course there are online services such as this and this too (but we’ve yet to see Amazon start selling it complete with free second day delivery included!). However, please wait a few minutes before rushing to buy some hundreds of tons of coal. You should read on to the next section. There are two major problems (as well as some minor problems) with coal that argue against our broad adoption of a coal strategy for our future energy sources. The first is that burning coal is harder on our furnaces than burning wood. The sulphur that is present in coal creates compounds that attack the metal of our stoves, fireplaces, chimneys, and other structures. This is nothing that can’t be reasonably compensated for when designing and building such structures, but it does accelerate the wear on all such things, compared to burning wood or natural gas or fuel oil. The second major problem is storing coal. Now, you might think that a natural unrefined substance such as coal, which has been slowly forming for 300 million years, and which you may also know is fairly hard to set on fire and to keep burning, would last another few million years without any problems after taking it out of the ground, but if you thought that, you’d be surprisingly wrong. Coal can be a potentially troublesome product to store. It reacts with air and with water, and the result of the reaction causes a release of heat. The release of heat does two things. First, it speeds up the reaction (making for a positive-feedback loop), and secondly, if it builds up sufficiently, it ignites the coal. So you can have a pile of coal, even in a cool and/or damp environment, that sets itself on fire. Amazingly, and completely counter-intuitively, spraying a pile of coal with water can increase the chances of it self-combusting. Coal not only burns spontaneously after it has been mined, it can also do so while still in the ground; indeed, according to this article, thousands of coal fires are burning all around the world, all the time. Coal fires in China burn through 120 million tons of coal every year, and contribute 2% – 3% of the total annual worldwide CO2 emissions from fossil fuels. Coal fires in stored coal piles are far from uncommon, and take very little time to start (75% of such fires start within three months of a coal pile being formed, and many of those fires within the first two weeks). A little known fact about the Titanic is that when it put to sea on its maiden voyage, it had a fire burning in its number six coal bunker. If you have large-sized piles of coal, you need a way to monitor their core temperatures. If the core temperatures reach 140°F, then you need to consider preventative measures, and by the time it gets to 150° it is time to break the pile and allow the coal to cool before repiling it. Coal generally will start to smoke at about 180°, and at that point, it is a bit too late because it is starting to combust. Note that coal will often steam as water dries off, this is different to smoking. Large lumps of coal are more resistant to spontaneous combustion than smaller lumps, and anthracite is the least susceptible, while lignite is the most susceptible. If there is a lot of air flow through the pile, that will keep the coal cool. If there is no air flow through the pile, that will keep oxygen away from the coal and limit the reaction. But somewhere in the middle, between ‘no air’ and ‘lots of air’ is a danger zone with enough air to encourage spontaneous combustion. It can only take a small amount of air flow for this to occur. So, if you are storing coal, you need to keep the piles small and monitor their core temperatures. A related issue is that coal deteriorates over time. It again seems strange that something which is formed so slowly over 200 – 300 million years is so apparently ‘unstable’, but you will definitely start to notice reductions in heat output from coal that has been stored for extended periods of time. These heat output reductions are probably not profoundly significant, and you can still store coal for many years, even tens of years, and still get valuable energy from it, and when you compare this to storing wood (which might rot) and liquid fuels (which need stabilizer and even then have a maximum storage life of perhaps ten years) it is clear that coal is as suitable for storing long-term as other energy sources. But it isn’t perfect. Another problem might be any clean air regulations in your state/county/city that restrict your ability to burn coal. The problem is that such laws almost certainly don’t say ‘except in an emergency when you can burn anything you like at any time for any purpose’. If the law says it is illegal to burn coal today, it will still be illegal to burn coal WTSHTF, and while enforcement might be thin, sooner or later some enterprising person will realize you are burning coal and will use the law as an excuse to legally ‘fine’ you, with the fine perhaps being the forfeiture of your remaining coal or food or anything else they wish it to be. On the other hand, if your region just has occasional, weather/air quality dependent burning bans, then perhaps, after TSHTF, the authority that rules on such things will no longer function, and/or, the lower level of general industrial activity will reduce the number of times during the year when coal is banned. Clearly if you plan to rely on coal as a year-round fuel source (eg firing a boiler that then provides heating, hot water, and possibly even electricity generation or a mechanical power source) you need to be sure you can legally use it year round. How Much Space Does a Ton of Coal Take Up? So, if you do decide to set aside space to store coal in bulk, how much space will you need? Our first comment is to remind you of the problems outlined in the preceding section to do with coal’s propensity to spontaneously self-combust. It is better to have a number of smaller piles/bunkers/whatevers of coal than one large one. If nothing else, we’d want to be sure that nowhere in our fuel pile was more than four feet from the outside. That might sound like a restrictively small size, but you could get as much as 6 tons of coal in such a pile. This is a very conservative suggestion, but better safe than sorry. Back in the 1920s, the Railroad Administration suggested piling coal for railroad storage not over twelve to fifteen feet in height when the track is placed on top of the coal pile, and not over twenty feet when a locomotive crane is used. The Home Insurance Company advised against piling in excess of twelve feet, or more than 1500 tons in any pile, and suggested trimming the piles so that no point in the interior was more than ten feet from an air-cooled surface. Coal is dense, but due to its irregular size and shape, it doesn’t pack efficiently. In general, you can expect to get from about 43lbs to 59 lbs of coal per cubic foot. Because coal is heavier than water, wet coal takes up more space for a given amount of weight than does dry coal. Older coal (ie bituminous or anthracite) will have a greater weight of coal per unit of volume than does newer coal. So, back to our suggestion you keep a coal supply in piles measuring 8′ x 8′ on their base and 4′ high – a total of 256 cu ft. If you work on say an average of 50 lbs of coal per cu ft, that would be about 12,800 lbs of coal, or 6.4 short tons per pile. You are using 10 sq ft of floor space to store a ton of coal. This was the second part of a two-part article about coal. If you’ve not already done so, you might choose to now read our first part, ‘Coal – A Prepper’s Friend or Foe‘. Coal is usually the second cheapest energy source in the US today. The two cheapest sources of energy in this country are strangely the two which ‘greenies’ hate the most – coal and nuclear. On the other hand, arguably the ‘cleanest’ source of energy is also the most expensive (electricity) and being as how almost half of all electricity comes from coal fueled power stations (and most of the rest from stations burning either natural gas or oil) the ‘cleanness’ of electricity relates only to what you see coming out of the wall rather than the total process of generating the power in the first place! But it isn’t our place, here, to get into a discussion on the illogic that surrounds too much environmentalism…. Suffice it simply to say that while it is of course entirely impractical to consider building your own personal nuclear power plant; depending on where you are, where you could source coal from (and at what cost) and any local restrictions on burning coal, you might find coal to be a surprisingly cost-effective and good solution for much of your future energy requirements. If you do choose a coal based approach to some of your energy needs, you are well advised to choose specific stoves/furnaces that are designed and optimized for the different burning characteristics of coal (compared to wood). We’d recommend you research the issues to do with using coal at your retreat. You might be surprised at how positive a coal based energy approach could be. Here’s an interesting reader forum type website that could be a good resource for preppers wanting to find out more about buying, storing, and using coal. Very good, very interesting thanks. I would also be in earing more about “This is nothing that can’t be reasonably compensated for when designing and building such structures, but it does accelerate the wear on all such things, compared to burning wood or natural gas or fuel oil”. And also about using coal on a wood burning stove. Basically, if building a structure to burn coal, you need to have heavier duty materials that can withstand higher temperatures, and should have straight large flues so that less soot will be deposited and that which is deposited won’t block the air flow. And, talking about air flow, you also need to have a proper grate that requires the air to flow through it and the porous coal ‘bed’ above the grate, rather than allowing air to flow around the grate. As for using coal on/in a wood burning stove, you should ask the stove manufacturer for their opinions and recommendations. An Emergency Low Capacity Power Supply for Your Regular Residence Coal – A Prepper’s Friend or Foe?